Happy Tuesday!!! I’m on a roll with the blog posts lately, and today I have another cute SheIn collaboration! It is featuring this cute tweed skirt. 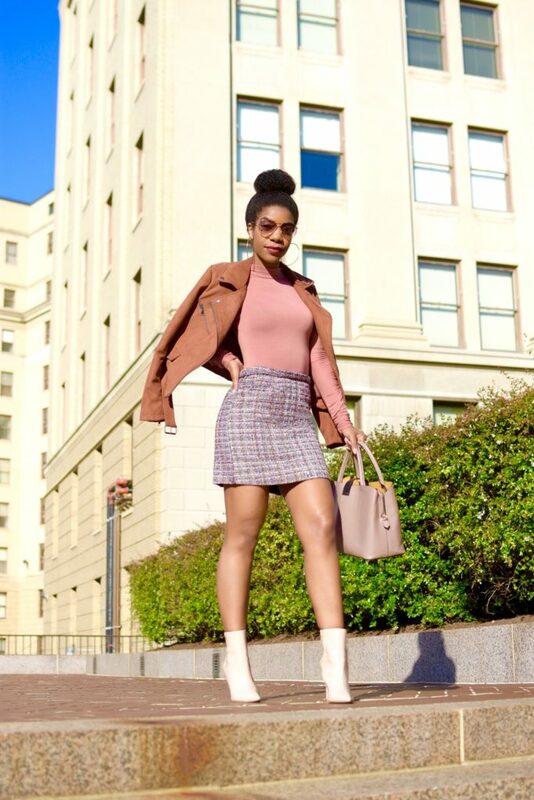 I’m all about skirts and booties for the fall, so naturally I chose this cute tweed skirt when I was ordering from SheIn! Also, if you haven’t noticed, tweed skirts are very on trend at the moment. What I love about this trend, is the fact that tweed skirts (and anything tweed in general) are also a classic piece. The quality of this skirt is so on point. It fits true to size, and I’m wearing a size Small. I tucked the waist under a bit to make it appear to be a little more fitted. 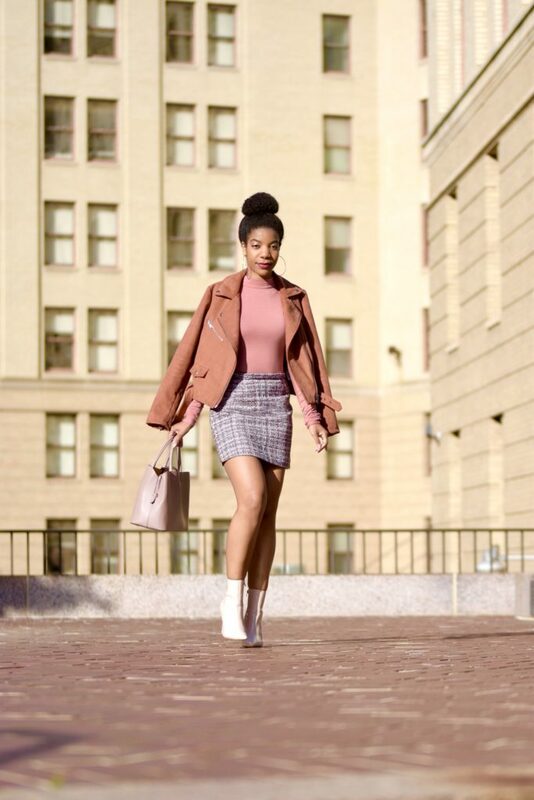 I decided to highlight the tiny bit of pink in the skirt by adding a pink bodysuit, and then further play up the pink tones with this cute mauve moto jacket. I kept the rest of the accessories neutral. Thanks for reading! Will you be rocking the tweed trend this fall/winter? Let me know below! This is such a nice fall look. I love how you paired the colors. These pictures are on point! 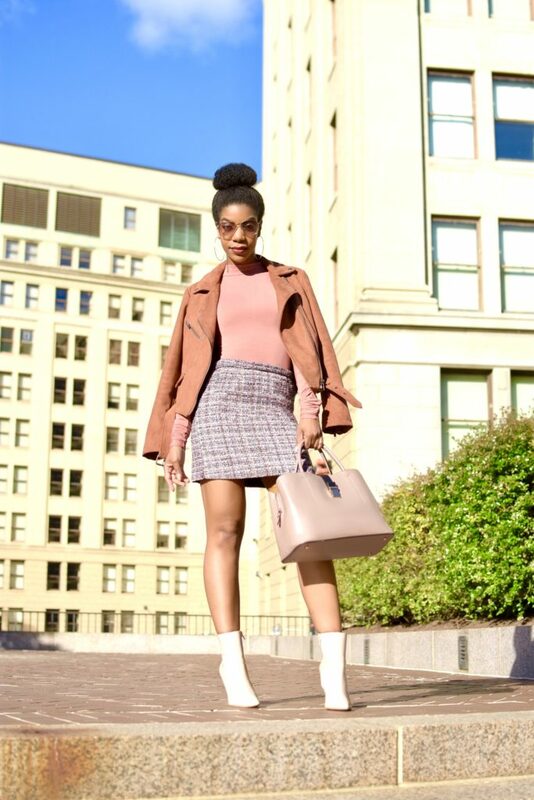 Tweed is def a classic and love the way you played up the pink! I love the retro look of this outfit. The picture editing definitely works well with the outfit. And those booties are the bomb. I’ve been looking for some bodysuits. I love the color of the one you’re wearing. Bodysuits go well under blazers and with a high waist pant or skirt. Ooooooo, I love this look.,i need to build up my skirt collection. I wish my legs were as fabulous as yours. This look screams fall! I’m loving the color scheme you went it and the accessories. I might need to pull out my tweed skirts asap! Perfectly chic. I love tweed I want to buy a while bunch for the season! I am loving everything about this look! 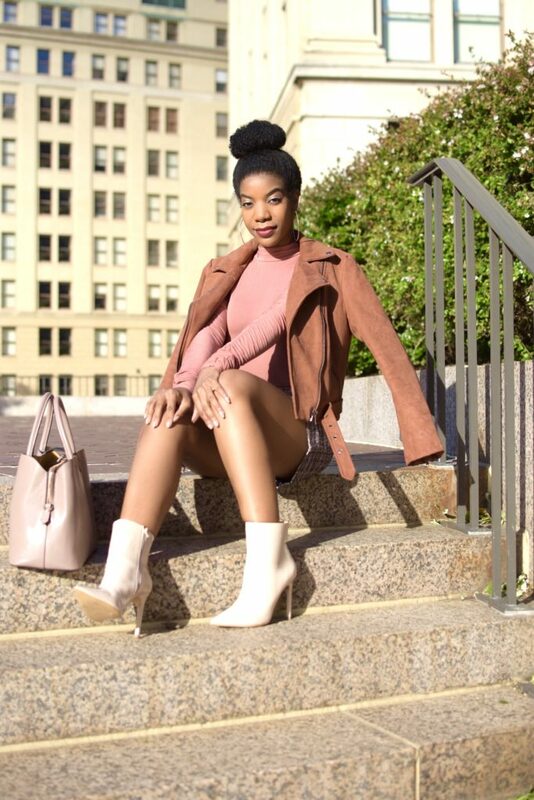 The boots are everything! Such a nice and colorful Fall look. I really like that jacket! Love the colors! This is simple and yet cute.